Catastrophic health insurance is covered under the Affordable Care Act. It is a high-deductible health plan for individuals under the age of 30 or those who meet the qualifications for a hardship exemption. These plans are intended to protect you in a worst-case scenario. 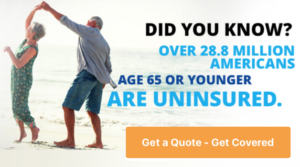 For instance, if you suffer from a medical emergency and are left with thousands of dollars in medical costs, catastrophic health insurance can ease your financial burden. You are in search of lower premiums. You cannot afford coverage that is more expensive. You are in good health and only visit the doctor in limited occasions. You are not bothered by high out-of-pocket expenses. You want to protect yourself against costly medical bills in a worst case scenario. You are not eligible for Medicaid. Your income disqualifies you from a subsidy. If you’d like further information on catastrophic health insurance, don’t hesitate to reach out to our health insurance professional at The Mair Agency. Call us today at (919) 459-2683. We have insurance agents in Wilmington, Raleigh, Charlotte and throughout the state.